Coconut oil against Alzheimer's Disease? Quite a lot of topics are caught in the Internet. I have asked recently, if coconut oil could be used against Alzheimer's. I had to confess my ignorance. But then I couldn’t just lean back and I had to investigate this topic. A "Health Center" (in Germany) promoted coconut oil: "in addition to all its advantages for weight, a healthy cholesterol level, an active metabolism and a strong immune system, coconut oil can relieve even the symptoms of Alzheimer's disease. Not only scientific studies, but also case studies demonstrate this as the Alzheimer's disease patient Steve Newport." Advantages in weight reduction still lack proof. Saturated fatty acids, and that’s what coconut oil is, raise cholesterol levels. What is behind the idea of an active metabolism? What is a strong immune system? How is it measured? And what is this related to Alzheimer's disease? If you look further and the whole hype is based on one case study (Steve Newport). The hypothesis that that coconut oil could reduce Alzheimer symptoms was developed by his wife, and now serves as the basis for all providers who wish to bring coconut oil to consumers. If it were so effective, there must be no Alzheimer's dementia in Germany anyway, at least not in households where Palmin is used as frying fat, because it consists of coconut oil. But let's search for studies. But there aren’t scientific studies on coconut oil and Alzheimer's disease, at least not known to the medical public. However, there are studies in mouse models of Alzheimer's dementia (OT: it hurts me in the soul, to speak of mice!). Y. Kashigawa and colleagues found improvements in testing learning and memory in mice under a ketone ester diet, however, these effects were only weakly expressed (http://www.ncbi.nlm.nih.gov/pubmed/23276384). Have a look at coconut oil/fat, it shouldn’t be expensive. You shouldn't spend more than € 20 per kilogram for organic coconut oil or € 5 for non-organic coconut oil. I think you shouldn’t use coconut oil at all, frying at high temperature increases cancerous substances. And it won’t act prophylactic on Alzheimer's. I’ll tell you more about the possible side effects of a new drug. Would you take this drug? The FDA has approved apremilast (Otezla) to treat adult patients with active psoriatic arthritis (PsA). The currently approved DMARDs include biologics like THN-alpha-inhibitors and an IL-12/IL-23 inhibitor (ustekinumab). There has been a study by Arthur Kavanaugh and colleagues (Abstract No. L13) at the 2012 ACR Meeting in Washington: “Apremilast, an Oral Phosphodiesterase 4 Inhibitor, in Patients with Psoriatic Arthritis: Results of a Phase 3, Randomized, Controlled Trial”. Conclusion: “Apremilast significantly improved signs and symptoms of PsA and resulted in statistically and clinically meaningful improvements in physical function. Apremilast was generally well tolerated and no new safety or laboratory signals were detected.” Lets look at some side effects: diarrhea (placebo: 2.4%; apremilast 20 mg BID: 11.3%; and apremilast 30 mg BID, 19.0%), nausea (high dose: 18.5%), headache (10.1%, and 10.7%), and more. At the 2013 ACR Meeting in San Diego we saw even more studies. There were some more studies shown at the ACR 2013 Meeting in San Diego, for long-term safety look at the following study. There sure are patients waiting for you! And hopefully Otezla will get EMEA approval soon. I've started this post on the outbreak of ebola virus on March 23rd 2014. It already is the most severe outbreak of this virus! You will have to scroll downwards to get to the earlier entrances of this post. http://www.who.int/mediacentre/factsheets/fs103/en/. Wikipedia: http://en.wikipedia.org/wiki/2014_West_Africa_Ebola_outbreak. There is no drug available! 13703 infected people, ~5000 people dead, 2 months ago: 3071 / 1553. There are some problems with correct statistics, but as the actual numbers are expected to be three times as high, 13703 reflects better, what is happening in West Africa. I had been on vacation. 16869 infected people, 6319 people dead, 3 months ago: 3071 / 1553. Yes, the fight isn't over. The media is going to sleep again concerning ebola. Bob Geldof got into contact with German singer Campino of Die Toten Hosen (@dietotenhosen), who produced together with other German stars an ebola version of band aid. Criticism against this was the same as in the UK. That's strange as any help is needed and any effort to spread awareness on what's happening in West Africa is welcome. The "newer" old entries are at the end of this blogpost. 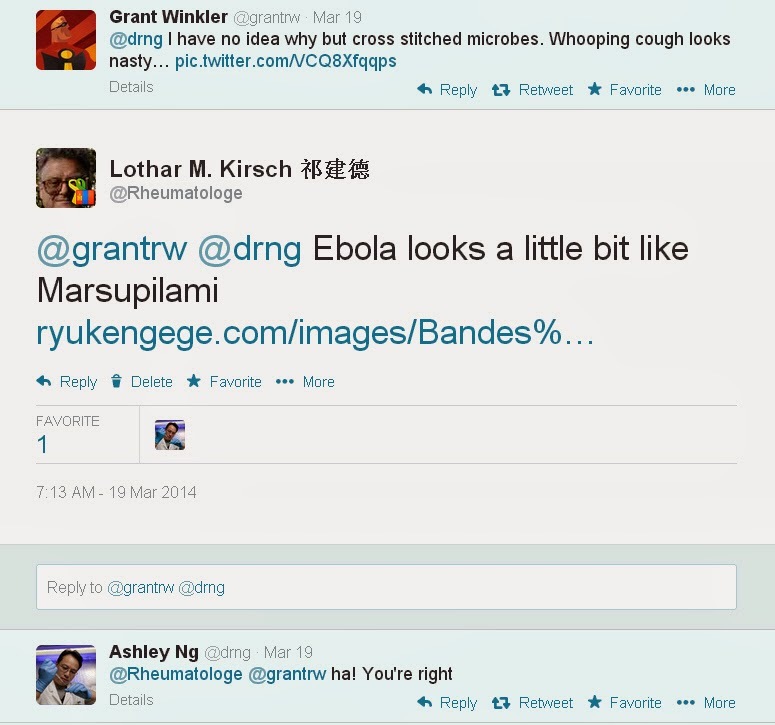 A couple of days ago I had been joking about Ebola virus on twitter, as it looks like the cartoon figure Marsupilami. And now we have another epidemic, the 16th by modern count (since we know to detect the virus). Ebola virus causes a hemorrhagic fever. It has a high lethality. First symptoms are headache, myalgia, fatigue, and fever as in many viral infections. Later patients develop disseminated intravascular haemorrhage and multiple organ failure. Right now there is an outbreak in Southern Guinea. BBC news report 59 dead out of 80 infected persons; link: http://www.bbc.com/news/world-africa-26701733. If you want to know more on the virus, look at Wikipedia: http://en.wikipedia.org/wiki/Ebola_virus_disease. “As an outbreak of ebola progresses, bodily fluids from diarrhea, vomiting, and bleeding represent a hazard.” The disease is highly infectious and contagious. More information on the recent outbreak also here: http://www.cbc.ca/news/world/ebola-epidemic-confirmed-in-guinea-death-toll-quickly-rising-1.2582861 - there’s also a good electronic microscope picture of the virus. It's unlikely that the disease will spreat around the world, though you shouldn't go to the risk area if your not part of a team of experts. Terrorists could use this virus, but as you need specific labs to produce this virus and first of all you need the virus, let's not start a buzz. This dream of terrorists won't become our nightmare. Yahoo News tells us that the epidemic is thought to have spread into Liberia. Liberian Health Minister Walter Gwenigale speaks of sic infected people, of whom five are already dead. http://news.yahoo.com/ebola-epidemic-spreads-guineas-capital-173304833.html. In Conakry (Guinea) there have been three people with hemorrhagic fever, who all tested negative for Ebola. This recent outbreak has already spread to Liberia and Sierra Leone. 70 people are dead out of 111 infected persons. There might be 11 victims of the disease in Sierra Leone and in Liberia, but only 2 have been tested positive for Ebola so far. Link: http://www.theverge.com/us-world/2014/3/31/5565482/ebola-kills-70-in-guinea-spreads-to-liberia-west-africa CBCNews has a story titled: "Ebola epidemic could become global crisis, experts warn" - "Health officials warn that the arrival of Ebola in this sprawling city of some 2 million people with an international airport could spell disaster. Among the poorest countries in the world, Guinea has severely limited medical facilities and a large population living in slums where the virus could spread quickly." "On April 29, 2014, the Ministry of Health (MoH) of Guinea’s reported 221 suspect and confirmed cases of Ebola hemorrhagic fever (EHF), including 146 deaths." The Detroid Free Press tells us, "Why Ebola isn't just Africa's problem". http://www.freep.com/article/20140503/OPINION05/305030017 - thanks ‏@DrJenGunter on Twitter. I've checked CDC's page: "The Ministry of Health (MoH) of Guinea’s reported on May 3, 2014, a cumulative total of 231 suspect and confirmed cases of Ebola hemorrhagic fever (EHF), including 155 deaths. ... According to the World Health Organization (WHO), the Ministry of Health and Social Welfare (MOHSW) of Liberia reported no change to the 13 suspect and confirmed EHF cases (11 deaths) in Liberia as of May 2, 2014." No new development according to the news. Here's the most recent data on the outbreak: http://www.promedmail.org/direct.php?id=20140526.2498287. "Since the beginning of the outbreak, the cumulative total number of clinical cases of EVD is 258, including 174 deaths." WHO is taking steps, including a high-level meeting for the Ministers of Health in the sub-region to be held 2–3 July in Accra, Ghana. A total of 567 persons have been infected in Guinea, Sierra Leone and Liberia. 350 people have already died of these. BTW: "WHO does not recommend any travel or trade restrictions be applied to Guinea, Liberia, or Sierra Leone based on the current information available for this event." A total of 599 persons have been infected in Guinea, Sierra Leone and Liberia. 362 people have already died of these. If you add also the supected and probable cases, then 759 people of Guinea, Sierra Leone and Liberia have been infected, of whom 467 have already died as of 30th of June. Link: http://www.who.int/csr/don/2014_07_01_ebola/en/. It's important to note, that the "WHO does not recommend any travel or trade restrictions be applied to Guinea, Liberia, or Sierra Leone based on the current information available for this event." If you look at the Wikipedia article, you can see that the recent outbreak is already the largest in the known history of the disease. Link: http://en.wikipedia.org/wiki/Ebola_virus_disease. The case fatality risk has been calculated at 64%! BBC reports, that a US citizen has been quarantined and is being tested for ebola virus in Accra (Ghana). Ghana had no confirmed cases of the virus during the current outbreak in West Africa. WHO gives new numbers: 964 people of Guinea, Sierra Leone, and Liberia have been infected, of whom 603 have already died as of 14th of July. "WHO does not recommend any travel or trade restrictions be applied to Guinea, Liberia, or Sierra Leone based on the current information available for this event." There has been an article in the New York Times two days ago: http://www.nytimes.com/2014/07/16/world/africa/death-toll-from-ebola-surges-in-west-africa-prompting-alarm.html?_r=0. Though it doesn't add much to what we already know, any article is welcome as not to let this outbreak go on unnoticed by world public. In the latest edition of Deutsches Ärzteblatt (Journal of the German Association of Physicians) more awareness is called for on ebola, especially in people returning from West Africa, who develop haemorrhagic fever ("Bei Reiserückkehrern an Ebola denken"). Behind this call is the Robert-Koch-Institute, which is the German equivalent of the CDC in the US. Sad to hear that Sheik Umar Khan has to be treated himself. WHO gives new numbers: 1093 people of Guinea, Sierra Leone, and Liberia have been infected, of whom 660 have already died as of 20th of July. Now that some of the people working against Ebola have been infected by ebola virus, this deadly disease might receive more attention. New York's Daily News has more on the second american aid worker, who has tested positive for ebola virus: http://www.nydailynews.com/life-style/health/ebola-outbreak-kills-senior-doctore-liberia-official-article-1.1881734. http://www.who.int/csr/don/2014_07_24_ebola/en/ - 1093 people are infected with ebola virus, 660 have already died! 1201 people are infected with ebola virus, 672 have already died! http://wwwnc.cdc.gov/travel/notices/alert/ebola-guinea. Important would be to avoid contact with blood or body fluids from obviously sick people or someone who has died from Ebola, also sick wildlife, or bats, who are the most likely reservoir for the virus, meat from infected animals, like cynomolgous monkeys. Cynomolgous monkeys are used in medicine in animal testing, but I guess that these animals are tested for diseases. I myself object animal testing, but these testings are required by FDA and EMEA for instance. "COULD EBOLA SNEAK ACROSS U.S. BORDER?" asks Drew Zahn on WND: http://www.wnd.com/2014/07/could-ebola-sneak-across-u-s-border/. The CDC has issued a warning on close contact: "Examples of close contact include kissing or embracing, sharing eating or drinking utensils, close conversation (less than 3 feet), physical examination and any other direct physical contact between persons,” the guidelines clarify. “Close contact does not include activities such as walking by a person or briefly sitting across a room.” Read more in the article. Maybe the disease gets more attention. Wikipedia has a graph on how many people are infected and have already died because of ebola virus: http://en.wikipedia.org/wiki/2014_West_Africa_Ebola_outbreak. Nigeria is now on the list, too. This outbreak shows a new quality, it doesn't stay in remote rural areas but has entered the bigger cities. And these cities are much nearer to the rest of the world than one would like. Local Liberians collect donations to help fight the disease: http://www.wsbt.com/news/local/local-liberians-collecting-donations-to-help-fight-ebola-virus-in-africa/27237354. I hope that the wealthier nations will help, too. "Nancy Writebol, a missionary from Charlotte working in West Africa to help fight Ebola, was diagnosed with the virus on July 25 and has been receiving care since being isolated in an outbreak that has affected more than 1,200 people in three countries." Read and see more here: http://www.today.com/news/son-american-ebola-patient-says-mom-fighting-through-it-1D79994691. BBC on "Can social media help prevent the spread of Ebola?" See: http://www.bbc.com/news/blogs-trending-28552917. Liberia: President Ellen Johnson Sirleaf has closed all schools, and she also presented a National Action Plan against Ebola. The boundaries have been closed. Sierra Leone: Sierra Leons is mourning for the head of the anti-Ebola campaign, Sheikh Umar Khan, who has died of the disease. Sierra Leone's President Ernest Bai Koroma has canceled his participation in the United States-Africa Summit in Washington; and he declared a state of emergency. Guinea: It seems that the information campaigns on Ebola virus are successful. Guinea is experiencing a lower incidence of new infections. The German Ministry of Foreign Affairs just has issued a warning on (unnecessary) travels to Guinea, Sierra Leone, and Liberia. 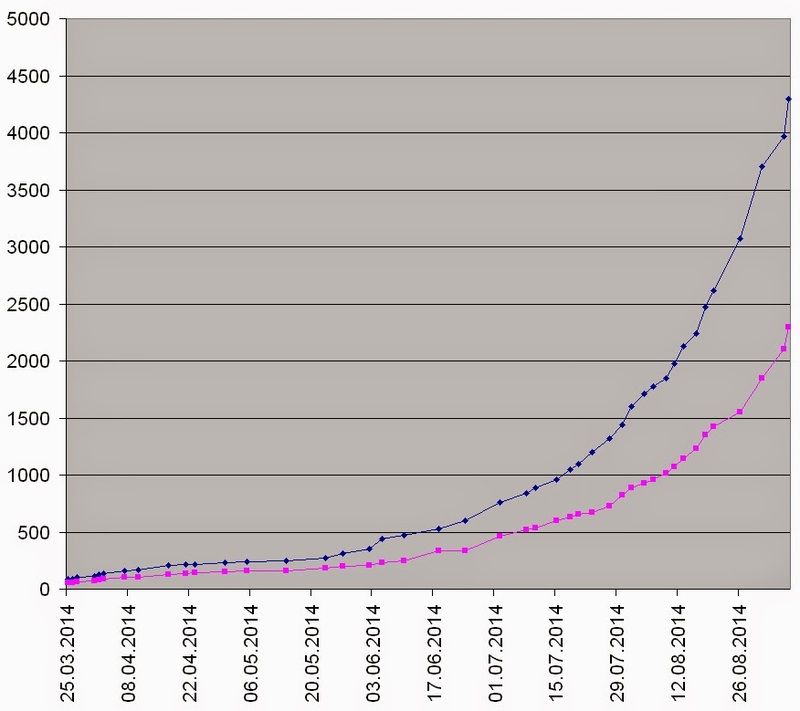 1440 people have been infected by Ebola virus, of whom 826 people already have died (data until July, the 30th). TKM-Ebola, an anti-Ebola virus RNAi therapeutic, is being developed by Tekmira.The US Food and Drug Administration (FDA) had granted Fast Track designation for the development of TKM-Ebola in March this year. However in July, the FDA had requested additional information on drug is safety at higher doses (phase 1 study on healthy volunteers). At this outbreak Tekmira hopes for being allowed a phase 2 study, which means testing the drug on patients suffering from ebola virus infection. Nancy Writebol and Dr. Kent Brantly, who had been flown out to the US, did’t get the drug. 1603 people have been infected by Ebola virus, of whom 888 people already have died. This is bad news as the graph shows that the curve gets steeper, meaning the disease is spreading more quickly than before. I have contacted the CDC, if they knew a substitute for virucidal hand disinfectants people could use in rural areas in West Africa. Isolation of infected people and common-sense hygiene can stop the spread of the Ebola virus. Ebola is easily inactivated with virucidal disinfectants, which are available in every hospital. We need education in hygienic measures in rural areas, where the disease is spreading. Hygienic hand disinfection with a virucidal agent is necessary after contact with ebola infected material. One highly effective virucidal hand disinfectant is Sterillium® Virugard. One should look for locally available alternatives. I'd like to know more about what is possible in rural areas of West Africa. From my experience in Mali I doubt that much is available in the villages. But the disease has to be stopped there! 1711 people have been infected by Ebola virus, of whom 932 people already have died. If Ebola goes on spreading with this rate, we soon have an equivalent to the pest during the middle ages. There are people combining conspiracy theory and orthomolecular medicine (high dose vitamin C). There's no scientific basis to this.If you want to look at it yourself, here's the link: http://jimstonefreelance.com/ebola.html, but I think it's a waste of time. Miguel Pajares, 75, a Spanish missionary priest is one of three missionaries in Liberia, who tested positive for Ebola. He is currently repatriated to Spain. Link: http://www.telegraph.co.uk/news/worldnews/europe/spain/11017332/Ebola-outbreak-Spain-to-accept-Europes-first-confirmed-case-of-the-virus.html. "A Saudi man who was being treated for Ebola-like symptoms has died at a hospital in Jeddah, Saudi Arabia's health ministry says." Ebola hasn't been confirmed, yet. Link: http://www.bbc.com/news/health-28678699. A cocktail of three plant derived antibodies seems to be tested on the two American Ebola patients. ZMapp has only been tested on monkey before. 1779 people have been infected by Ebola virus, of whom 961 people already have died. If you look at the incidence rates, Guinea has hardly seen any new infected people, the real increase seems to be hitting Sierra Leone and to a lesser degree Liberia; both countries surpassed Guinea in numbers. The death rate in Guniea had been calculated 64% so far. It feels a little reassuring that the governments of both Liberia and Sierra Leone have declared a state of emergency. People are asking if the declaration by the World Health Organisation (WHO) of the Ebola outbreak in West Africa to be an international public health emergency doesn’t come too late. I have started to write on this Ebola outbreak on March 23rd and have been wondering more than once on Twitter, why this catastrophe isn’t getting more attention. Doctors Without Borders (MSF) think that the of declaration international public health emergency comes to late. Nevertheless we have this declaration and let’s hope that more will be done to stop further spreading of Ebola virus. What about face masks? In principle these aren’t necessary, if you don’t have contact with infected people or materials. Ebola is transmitted by smear infection. So you need rubber gloves. Since you might touch your face by chance after having touched infectious materials with the glove, you’d better wear a face mask. Let’s talk again about the question of disinfection in rural Africa or also in the poorer quarters of the cities. What can someone do, if a contamination of the hand has occurred? Virucidal disinfectant is best, no questioning, but might not be available. Washing your hands with soap and water, better more than once, will reduce the risk of infection. I still hope that the WHO in collaboration with local health authorities will issue guidelines for the general public. The WHO didn't issue new statistics. As the virus is highly contagious and very deadly, the fears aren't without ground. But we need not get hysterical. It is possible to end the desaster by consequent quarantine. The German paper DIE WELT published an interview how Ebola might get to Europe. They interviewed Prof. Dirk Brockmann, who published an interactive network analysis: "2014 Ebola Outbreak: Worldwide Air-Transportation, Relative Import Risk and Most Probable Spreading Routes". Link: http://rocs.hu-berlin.de/projects/ebola/index.html (text is in English). The risk assessment takes into account air traffic. How about the idea of 200 boat people reaching Europe clandestinely? There are risks that can be calculated, and some risks refuse calculation. WHO Director general Margaret Chan said: "The outbreak is moving faster than we can control it". I hope that we get new statistics today as the available ones are five day old. That is far to long! We have an update on the statistics. 1848 people have been infected by Ebola virus, of whom 1013 people already have died. Within three days guinea had 11 new patients, Liberia 6, Sierra Leone 13, and Nigeria had none. ZMapp will be tested in Liberia. All supplies have been sent to Liberia. The drug hasn’t been evaluated in humans, safe for the three evacuated patients. Liberian President Ellen Johnson Sirleaf requested the drug, albeit there still are ethical concerns. BBC has the whole story: http://www.bbc.com/news/world-africa-28749615. “The drug is composed of three humanized monoclonal antibodies that are produced transgenically and subsequently grown in large numbers in the tobacco plant Nicotiana in the bio-production process known as "pharming".”More on ZMapp at Wikipedia: http://en.wikipedia.org/wiki/ZMapp. The Swiss online 20 Minutes discusses “Will refugees bring Ebola to Europe?” Link: http://www.20min.ch/ausland/news/story/Bringen-Fluechtlinge-Ebola-nach-Europa--20311564. Background for this article are fears in Italy that the masses of boat people might bring Ebola to Europe as more than 100,000 people have reached Italy this year. Right wing politician seem to use Ebola as a pretext to stop the refugee operation “Mare Nostrum”. Beatrice Lorenzin, the Italian Minister of Health, stated: „Not every African with fever has Ebola”. 1975 people have been infected by Ebola virus, of whom 1069 people already have died. The curve of new infections is getting steeper again. Old chart removed, new chart see above. Liberia Becomes Epicenter Of West Africa Ebola Crisis. Jason Beaubien and Steve Inskeep talk about the crisis in Liberia. “In recent weeks, Liberia has reported the largest number of cases. It is also a country from which the virus has spread. A traveler from Liberia carried the virus to Nigeria.“ „When you look around, every shop has a small barrel out front with a little tap on the bottom of it where you can wash your hands as you go in and out.” Link: http://www.npr.org/2014/08/13/340005056/liberia-becomes-epicenter-of-west-africa-ebola-crisis. USA Today is also covering news of Ebola: “In Liberia, which had 71 of the new cases, contact tracing has proved much more difficult, the WHO said, and more international help is needed.” “Now doses of ZMapp have been allocated to two Liberian doctors and could arrive as soon as Wednesday in Liberia, according to Liberian Health Minister Walter Gwenigale. They would be the first Africans known to receive the treatment.” Link: http://www.usatoday.com/story/news/world/2014/08/13/ebola-doctors-sierra-leone/14003411/. 2,127 people have been infected by Ebola virus, of whom 1,145 people already have died. Not only are these new statistics alarming, but also the beginning of people sensing that these numbers are only the tip of an iceberg. It’s uncertain how many infected people are off the grid, and therefore pose a much greater risk of being the nucleus for further infections. All other outbreak summed up together had less people infected (985) than the current one; link: http://www.cdc.gov/vhf/ebola/resources/outbreak-table.html. This is alarming as it might spread the disease more quickly. Today the news on Ebola is sparse. The world moves on to other topics, but here is the topic that needs attention. Syria and Sudan aren’t as present in the news as these countries should be, the world lost interest. The WHO should issue daily statistics. The last statistics are a six days old. We should get Ebola into the news again, help to stop the outbreak before it becomes a threat to the world. Later: the new statistics up to the 16th of August are available now. 2240 people have been infected by Ebola virus, 1229 people of whom already have died. 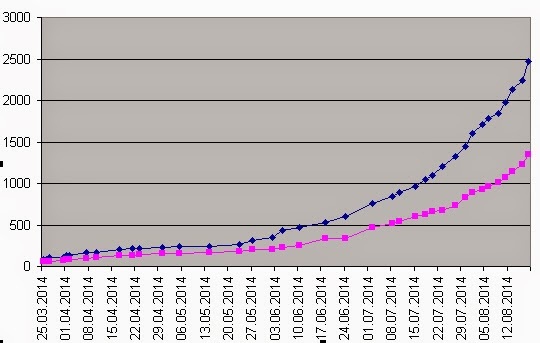 The curve is getting steeper, meaning we're getting into geometric progression. 2473 people have been infected by Ebola virus, 1350 people of whom already have died. WHO twittered: "An #Ebola case in a previously unaffected area of #Guinea was reported last week, indicating continuing spread to new area". The German press is occupied with someone in Berlin, who luckily has been tested negative for Ebola; link: http://www.rbb-online.de/panorama/beitrag/2014/08/ebola-verdacht-arbeitsamt-storkower-strasse.html. BBC News has an optimistic note as three physicians in Liberia seem to recover after taking ZMapp. More information on ZMapp below. Link for the BBC article here: http://www.bbc.com/news/world-africa-28860204. The people getting ZMapp are doing better, but it isn’t clear whether this is due to the experimental drug or good intensive care or a better immune system. Favipiravir (T-705) is a RNA polymerase inhibitor, which has been developed in Japan against influenza. The drug has shown efficacy against Ebola in animal experiments. 2615 people have been infected by Ebola virus, 1427 people of whom already have died. The largest increase is seen in Liberia. The WHO didn't issue new statistics on the development of the Ebola outbreak in the West African countries. The index case has bee a pregnant woman from Ikanamongo Village, Boende [Equateur province]. The local health authorities are supported by a field team of the Ministry of Health from Kinshasa. 24 suspected cases of haemorrhagic fever, including 13 deaths, have been identified. "The index case and the 80 contacts have no history of travel to the EVD-affected countries in West Africa (Guinea, Liberia, Nigeria, or Sierra Leone) or history of contact with individuals from the affected areas." "At this time, it is believed that the outbreak in DRC is unrelated to the ongoing outbreak in West Africa.Contact tracing has begun and 80 individuals are currently being followed-up." Please use a translation program. New statistics released today: 3069 people infected by Ebola virus, 1552 people already have died. According to Spiegel-Online WHO fears that more than 20,000 people have been infected and that the outbreak will last 6-9 months. I call this an optimistic view. Not only will there be more infected and dead patients, but in the wake the already weak economics of the West African States will collapse and even more people will die in the following famine. Helping with the infrastructure now would be a good investment. I haven't seen any new information on the Ebola outbreak in Congo. Again we’re waiting for new statistics! Which drugs are in the pipeline? ZMapp – much hype around the antibodies prepared using tobacco plants. Right now all ZMapp is gone. It had been tested in monkeys and three humans, whereof one died (Miguel Pajares, a 75-year-old Spanish missionary) and two survived. This could be the ratio of optimal intensity care. TKM-Ebola uses small interfering RNAs (siRNAs), which interfere with the production of certain proteins Ebola needs. It has been tested on monkeys, too. The FDA had stopped a study on humans (phase 1 study) because of safety concerns, but the study is going on again. Two vaccines are under development and should be tested in 2015 on humans. Too bad, the outbreak in Nigeria seemed to be very contained, but a doctor had secretly treated an infeceted diplomat, got Ebola himself, spreaded the disease, and died. He even operated patients. Who has an Ebola problem? We all have as it developes with increasing speed. Funkhaus Europa, a world music station in Germany, just mentioned Sierra Leone's Refugee All Stars, who are Sierra Leone 's most famous band. Together with a television production company tey started a campaign eo increase awareness on Ebola. "They want to warn their countrymen against the Ebola epidemic with small video clips." Senegal has the first Ebola patient! I guess the numbers on Nigeria are much higher than the ones given by WHO. 3,967 infected / 2,105 dead. 4293 people infected by Ebola virus, 2296 people already have died. The curves get steeper! I’d like to talk about the three newest studies concerning Ebola virus shown on PubMed. All these studies weren’t triggered by the current outbreak! Wikipedia changes to log scale view! 5072 people have been infected by Ebola virus, 2459 people already have died. The statistics show no reduction in the rate of new infections, actually one can see an increased rate. And WHO has stated the reported numbers "vastly underestimate the magnitude of the outbreak". "As of September 9, 2014, there have been 31 more cases of Ebola reported in the Democratic Republic of the Congo (DRC), increasing the total number of cases to 62 and the total number of deaths reported to 35." As of 14th of September 5339 people have been infected by Ebola virus, 2586 people already have died. I won't be able to look after my blog during the next days. 8033 people infected by Ebola virus, 3865 people already have died. Though Spain and the USA have entered the countries being affected, it doesn’t mean that the disease is spreading across borders. Senegal, Spain, and, the USA each have had only one patient each so far. Nigeria is promising as the disease has been contained there. I have been very upset by the physician, who could have spread Ebola. But luckily this hasn’t happened. The cases of the Nigerian physician and the Spanish nurse show the importance of meticulous hygienic measures – a break might cost a life, maybe even lives. The Spanish case also show how much education still is needed as nobody suspected Ebola, even as the nurse told she had been in contact with the Spanish missionary, who had been evacuated because of Ebola. Let’s learn from mistakes! I’ll see that our hospital will be prepared. The recent Ebola cases in health care personel in Spain and the USA show that we still need more awareness of Ebola and information on Ebola to reduce the risk further spreading the disease; not only in Western Africa but world wide. On the one hand there are irrational fears, on the other hand there’s also a lack of information, by the way not only in the nursing staff but also among physicians. But nurses and doctors are good multipliers for information. The case in Houston open other dimensions: instruction in self-protection must be refreshed and current instruction in self-protection have to be re-evaluated. Maybe Ebola needs more precautions such as using bleach on the gloves before removing them. 8399 people infected by Ebola virus, 4033 people already have died. That makes death rate of 48%, but this number doesn’t count in the patients, who still fight the disease and of those some more will die. A.J. Kesel and colleagues presented the following study: “Retinazone inhibits certain blood-borne human viruses including Ebola virus Zaire.” Conclusions: “RTZ represents the first reported antiviral agent capable of eradicating HIV and HBV proviruses from their human host. Furthermore, RTZ represents a potent and efficacious small-molecule in vitro inhibitor of Ebola virus Zaire 1976 strain Mayinga replication.” There might be a chance having at least a drug with some potency against Ebola, but it’s still too early and might be too late for this Ebola outbreak as in vivo studies have to conducted first. 9216 people infected by Ebola virus, 4555 people already have died. That makes death rate of 49%, but this number doesn’t count in the patients, who still fight the disease and of those some more will die. Please bear in mind that I started this blogpost half a year ago with 111 people infected by Ebola! If you follow the news, you see that we're now at a stage of panic and paranoia. First we had neglect and avoidance. The came a phase with "promising drugs" - none had been adequately tested, but some people and companies always look for holes in the system to circumvent proper research. But now it's the worst we had so far. People are calling for measures that satisfy their paranoia and won't take anything off the risks Ebola bears. Someone went near an Ebola patient without a protective suit and "everyone" knew he was stupid. He was stupid showing off this way in public, but he wasn't taking any risks as the patient wore a protective suit and Ebola isn't tranmitted airborne. I hope politicians will follow professional advice instead of the paranoid cries of the streets. 9936 people infected by Ebola virus, 4877 people already have died. That makes death rate of 49%, but this number doesn’t count in the patients, who still fight the disease and of those some more will die. Lots of hope is put into new vaccinations, which are indeed promising, but will only be tested in the near future and will come too late for this outbreak. So other measures have to be taken immediately and this means educating the rural population in the West African countries. Today I received a mail by the German Association of Internal Medicine covering the subject of Ebola. • The initial assessment is made by the general practitioner, the emergency service is not suited for it. • In most cases it will be another known tropical disease , usually malaria. For persons who have entered this year from a West African Ebola territory to Germany, malaria was diagnosed in 14 cases, but in no case Ebola. „If the critically done diagnosis points to Ebola, special protection is required (www.rki.de/ebola-massnahmen) and the appropriate treatment center (Berlin, Frankfurt Main, Düsseldorf, Leipzig, Hamburg, Stuttgart, Munich) will be notified. 9964 people infected by Ebola virus, 4881 people already have died (49%). Another infection in the US and an infected infant in Mali show that Ebola can spread across borders. 10141 people infected by Ebola virus, 4922 people already have died (49%). Countries affected: Liberia, Sierra Leone, Guinea, Nigeria, United States of America, Mali, Senegal, Spain. Please note that about half a year ago there had been less than 200 people with Ebola. 12008 people infected by Ebola virus, 5078 people already have died (42%) [?]. Maybe it should be 10208 and the death rate would be 50%. Source: Wikipedia.